The What: Peerless-AV has begun shipping its newest kiosk, the Ultra-Slim Portrait Kiosk (KIPC35 Models). The What Else: Peerless-AV can integrate an Ultra-Slim Portrait Kiosk with a wide array of components such as a flat panel display, media player, touch technology, camera, and software from various digital signage partners, including NEC Display Solutions, Samsung, Sharp, Panasonic, Philips MMD, LG, AOpen, and more. 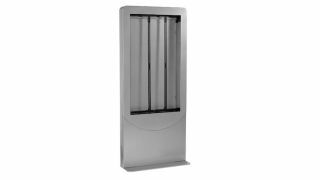 In addition to a slimmer design, the new line of Ultra-Slim Portrait Kiosks offer a robust set of features, including eight-way, tool-less adjustment to quickly position the display within the kiosk window for a flush alignment; enhanced security through hinged rear doors with combination locks, allowing access to parts requiring maintenance; customization through a range of aesthetic options, including multiple colors, and vinyl wraps to meet the needs of any environment or brand; and ADA compliance. The Bottom Line: Featuring a sleek, preassembled design with lean frames and a small footprint, Peerless-AV’s Ultra-Slim Portrait Kiosk serves as a digital signage solution for applications including corporate, education, transportation, retail, and more.